For a generous part of the 2000’s I was lucky enough to work at the Society of Illustrators in New York City. While there I wore many hats, but my official title was both Membership Coordinator and Exhibition Coordinator. This duel position allowed me to rub elbows with a distinguished pantheon of professional illustrators, designers and art directors. I was first exposed the the Society in high school by way of their annuals and had developed quite a list of influential names I would one day get an opportunity to meet. One name in particular that was high on my list was Fred Woodward. 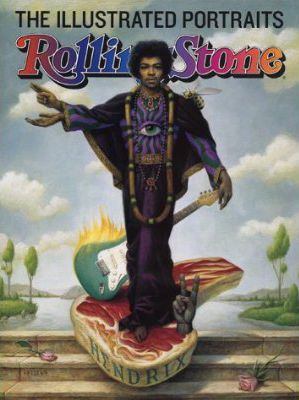 Fred was the Art Director of Rolling Stone magazine for almost 15 years and much of the illustration work I most admired came from that magazine. Illustrators like Chris Payne, Anita Kunz, John Collier, and Philip Burke regularly graced the pages with stunningly well crafting portraits of the days most influential rock icons. Bringing these heroes to life in a way no photograph ever could. In 2000 the Society played host to an exhibition of illustrated portraits from Rolling Stone magazine (of which there was a companion book). Of all the magazines I wanted to work for RS was at the top of the list. Music was a big part of my identity growing up. It was leafing though album covers at a local record store that inspired me to make pictures in the first place. In high school I started a business painting album covers on the back of denim jackets ($20 for something simple like Pink Floyd Dark Side of the Moon $60 for something complex like Judas Priest Sad Wings of Destiny). That’s how I learned to paint. You can imagine how excited I was to be working somewhere that would grant me access to the magazine and some of my all time favorite paintings. The day the exhibit was hung Fred happened to be in the gallery and took an active interest in getting the art up on the walls. There were three or four pieces delivered to the show without frames and this gave me an opportunity to help. Prior to working at the Society I had many years of experience at custom frame shops in the area. As a matter of fact Terry Brown, then Director of the Society, hired me because of it and even allowed me to set up a small independent frame shop at the Society. I managed to scavenge a few frames for Fred and before the day was over he was able to hang the pieces. At the end to the day Fred thanked me for my help, and terrified, I asked him “What does an illustrator have to do to get an interview and show you their portfolio”? “Just ask” he said. So I did. He put me in touch with his assistant and I set up an appointment. In those days Rolling Stone had a designated portfolio drop off day where hundreds of illustrators would dump their book off at their basement mail room. Hopefulls could drop off their book on Tuesday, looking past the annoyed mail room guy, to multiple stacks of identical portfolios piled five or six feet high. Two days later one could return to pick it up. I’d swear on the return visits the same annoyed mail room guy pulled my book from the exact same spot he placed it in two days before. To have Fred’s number, and a way to circumvent those stacks, would be a tremendous leg up. A week or so later I found myself in the lobby of Rolling Stone magazine. Next to DC Comics and Henson Studios, Rolling Stone had the best reception area with an authentic Pete Townshend guitar smashed to bits and encased in lucite. Fred brought me into his office and we chatted for a minute. As I began to show him my book, Jann Wenner (RS Co-founder and Publisher) barged into the office saying something about finding a blue dress. Jann was referring to the Clinton/Lewinsky scandal and this was breaking news that would come out the following day. I don’t recall any other chit-chat between us, but after Fred finished leafing through my book he turned to me, looked into my soul and said, “You’re still a student”. I didn’t know how to respond to that. I certainly didn’t feel like a student and thought that by virtue of standing in Fred’s office I was not one. I was a professional, wasn’t I? I’d been doing freelance illustration work for 5 years by then. I left shortly after that with a whirlwind of thoughts in my head. Still a student? What did that mean? More than 10 years have passed and I never worked with Fred Woodward or for Rolling Stone. However, in the last few years I have come to understand what Fred was talking about. It’s the goal of a student to absorb, learn, and take in. To react and process. Then produce something that proves an application of the recently acquired knowledge. But, as I had forgotten, the ultimate goal of being student is not to be a student anymore. That doesn’t mean that one should not try to learn anything new. What it means is one should be in command of themselves. A student is always being told what to do or how to do it. As a result students become comfortable in a passive, subordinate role and in most situations expect others to tell them what to do. As opposed to understanding their own personal needs, or the needs of a given situation, and doing for themselves. Students are like passengers and a teacher like a driver, steering the student to particular bits of knowledge and wisdom that are relevant to a given subject. But what should happen, what needs to happen, is the student must lean to drive themselves. When I was in Fred’s office I put him in the position of driving. I didn’t realize it then, but I do now. What Fred really needed was someone to drive. That’s what makes someone a professional. That’s what makes a job like Fred’s easier. Chris Payne, Anita Kunz, John Collier, Philip Burke, they are drivers. And the way they drive is what got them in the pages of Rolling Stone. It took me 10 years and a couple big life experiences to get what Fred was talking about. But I’m glad I got there and consider myself lucky. Some folks never do. Epilogue: When the show at the Society ended I had to return some of the art to the rightful owners. One of the pieces happened to be owned by Yoko Ono. I had to hand deliver the art personally to Yoko’s office in The Dakota, which was originally John and Yoko’s apartment. When I arrived sections of the block around the Dakota were closed off and I had to access Yoko’s place from a side entrance. As it turns out the street was closed for a movie shoot. The movie in question was Vanilla Sky staring Tom Cruise who’s character runs a music magazine and is based on Jann Wenner. I enjoyed this very much. Why don’t you send the piece to Rolling Stone. I bet they would like it. Thanks Mickey. That’s not a bad idea. Although Fred is no longer at Rolling Stone. I believe he’s at GQ now.